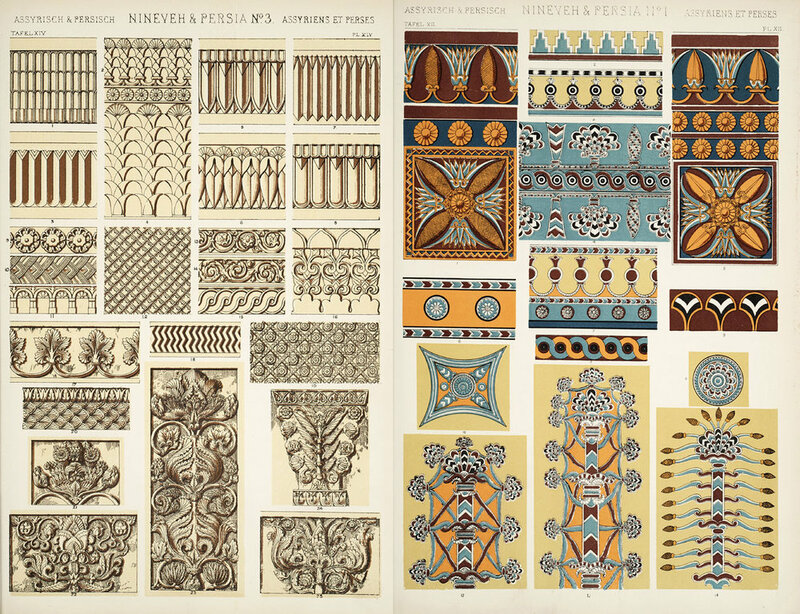 Owen Jones's contributions to the design world are vast and could easily have an entire series of posts dedicated to them, so I've decided to narrow it down and focus on his best known and arguably most influential work, The Grammar of Ornament (1856). The resource came to fruition due to Jones's close connection to Henry Cole, the first director of the Victoria & Albert Museum (which was then called the South Kensington Museum). The driving concerns were that visits to the institution would engender surface level emulation as opposed to instilling a deeper understanding of the influences and principles behind the designs displayed. This would have worked directly against one of the key motivations behind Jones's career, which was to encourage the creation of a style specific to the modern age (the 19th century). The second major purpose was simply access. In examining these goals, it is striking that The Grammar of Ornament still achieves them today. Other aspects of the publication haven't aged quite as well. It is important to keep in mind when using The Grammar of Ornament as a reference that you are also using Jones as a reference for evaluating the aesthetic contributions of entire cultures, and his view is distinctly Western. For instance, the ornament of several Western cultures get divided up into such specific, era-focused sections as "Medieval," and "Renaissance," while civilizations with equally vast histories, such as China, simply get the one section of "Chinese." Right off the bat, the opening section focuses on the ornament of "Savage Tribes." Although it is actually quite complimentary of the nature of the arts of early civilizations, it is done so in an undeniably condescending manner, and the language used throughout carries many issues typical of Western thought at this time. The consequences of this perspective, which has dominated much of the world through Westernization, are still quite evident despite the decline in use of specific words like "savage," and any consumption of it should be surveyed with more than a grain of salt. 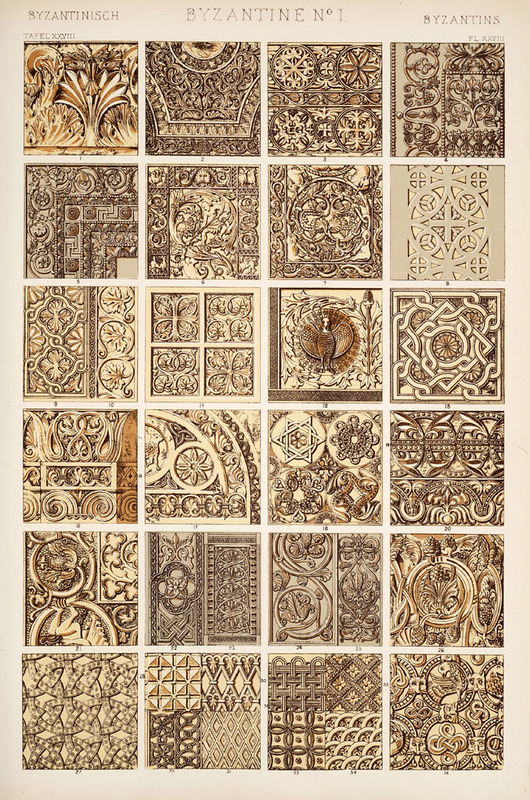 That being said, Jones's works, including The Grammar of Ornament, are unusual for their time in their global nature and in the praise and value given to Eastern designs and principles. The first documentation of design of this scope, The Grammar of Ornament's thoroughness and academic nature lends a seriousness to the global study of style and its interplay with culture. While celebrating the myriad aesthetic languages lovingly and painstakingly developed throughout many ages all over the world, it also carries an astounding beauty all of its own. Most importantly, it highlights and examines the innately human drive to ornament the world around us. I think what would make Jones happiest is that he undeniably did contribute to the stylings of a modern age, and his works continue to do so. Now, enjoy the plates! All of the images are courtesy of the Kohler Art Library at University of Wisconsin, Madison (which, as an alum, used to be a regular spot for me!). The selection of plates shown is simply from my own personal preference in perusing through them—there are many, many more beauties, so I encourage you to look through for yourself! The final section of the book differs from the others in that it does not focus on one culture. Instead, it is called "Leaves and Flowers from Nature" and discusses the relationship that design has to the natural world. "We have endeavoured to show in the preceding chapters, that in the best periods of art all ornament was rather based upon an observation of the principles which regulate the arrangement of form in nature, than on an attempt to imitate the absolute forms of those works; and that whenever this limit was exceed in any art, it was one of the strongest symptoms of decline: true art consisting in idealising, and not copying, the forms of nature." He also goes on to say that "the more closely nature is copied, the father we are removed from producing a work of art." As with many of Jones's assertions, I find this too black and white of a statement—I'm not as drawn to hard and fast rules, especially when it comes to something as intangible as what it means to create art. However, I do think that they're interesting concepts to mull over, and the plates that follow are certainly beautiful!